Robert Hannaford was working in his studio one day when he happened to catch a glimpse of himself in the mirror. The way his right eye was cropped struck him as an interesting idea compositionally and was the impetus for this portrait, which he worked on for a year. It was not painted specifically for the Archibald Prize, says the artist, who has painted a number of self portraits over the years. Born in 1944, Hannaford lives and works in Riverton, SA. A largely self-taught artist, he is acclaimed for his portraits but also paints landscapes and nudes, and is a sculptor. His sculpture of Sir Donald Bradman stands outside the Adelaide Oval. 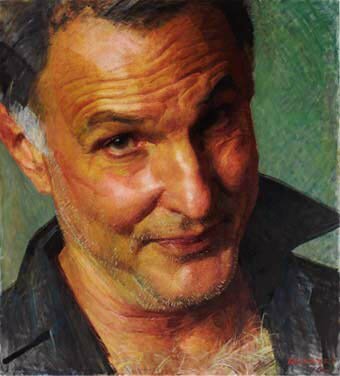 He won the Doug Moran Portrait Prize in 1990, the Fleurieu Landscape Prize in 1997 and the Archibald People’s Choice Prize in 1991, 1996 and 1998. This is the 14th time he has been an Archibald finalist.